Many Visitors Akiba Info Center~Christmas Eve! 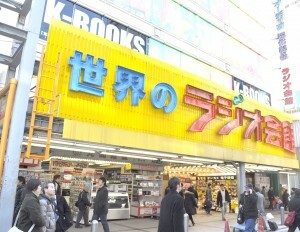 Today, I was on duty at Akihabara Information Center which opened 9th December 2010. As many as over 30 visitors from overseas including Westerners, Asians and Japanese came to look for various places of interest or products information there. There was a special event at a Akihabara-nerds spot, Dear Stage for Christmas just behind the center. Hope everybody enjoy Christmas eve! Studio Ghibli announced next animation film which will be shown in Summer 2011. The film is based on a girl’s comic titled “Coquelicot zaka kara (From the corn poppy slope)” by Ms. Chizuru Takahashi. The comic depicts the days of Japan’s rapid growing era in 1960’s. Mr. Hayao Miyazaki, himself painted the poster which was disclosed at the press conferrence. 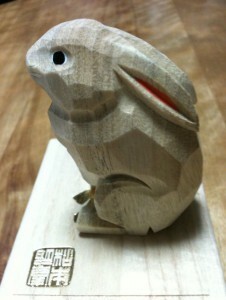 ↓for the picture & Japanese news article. 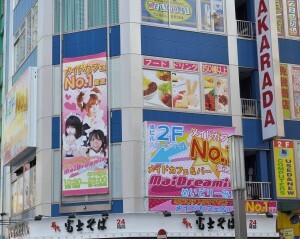 Akihabara Information Center Open~ maid-cafe, costume-play etc!! 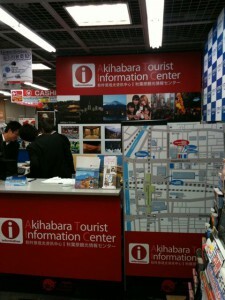 Long awaited Akihabara Information Center has opened last week with the speech by the chief of the Japan Tourist Agency. The center will provide various information on unique Akihabara cultures including maid-cafe, costume-play cafe, animation etc for foreign visitors in English and Chinese. Walking tours by certified professional guides as well. The video below (Mostly Japanese ) is a report by a Tokyo tv station on the opening cermony and a couple of comments by western tourists. Lonely Planet top 10 countries for 2011~surprisingly affordable Japan!! 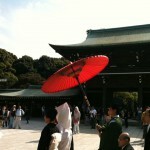 Lonely Planet announced top 10 countries for 2011 including Japan! This is a big pleasure for us all! Below is the quote from the Lonely Planet. 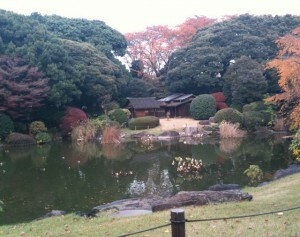 Autumn Leaves Viewing around Tokyo! in Tokorozawa, Saitama Prefecture which is famous for its autumn leaves viewing. Autumn leaves viewing around Tokyo area is also in full bloom! Funny? 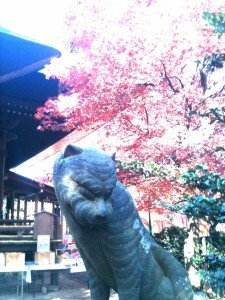 19 century tiger stature ‘Komatora’, whose smaller version can be devoted as a sacrificial object, was there to guard against evils. 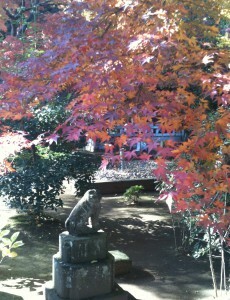 Autumn Leaves in Nikko! Even Snow! 15th November, I went to Nikko Toshogu Shrine, one of 11 World Cultural Heritage sites in Japan. Besides Toshogu, autumn leaves in orange, yellow and red were mixed harmoniously to impress my guests so deeply. They were overwelmed by such magnificent natural beauty of Japan even after shocked by the imbalance of Tokyo metropolitan city in many ways. Also, Nikko was very exotic on the day, partly because Mt. Nantai, over 1200 meter above sea level, were slightly covered by snow! Fortunately, they promised me to come back Japan to explore more before they left for the next destination, Taipei. Sorry I was too busy in Nikko! 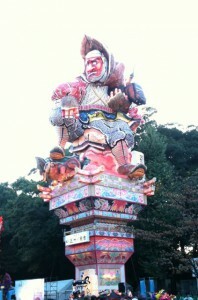 The picture is an object of Aomori Nebuta paper statue appeared in an event at Meiji Shrine. Quiet Autumn has returned~Akihabara Campaign End! 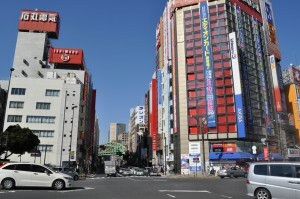 Akihabara Tourist Campaign2010 with certified guides bodies has ended with positive results. And, quiet Autumn in Tokyo has returned. I attended a couple of occasions to enjoy profound beauties of Japanese culture last week. One is a special night-time performance of Noh drama in Meiji Jingu shrine in Harajuku which is usually closed after sunset. The dark approaches to and from the main premaise were surrounded by hundreds of small candles in small white box. People solemnly attending the occasion were walking slowly toward the performing area with at most care to avoid colliding as their sights were very limited. Another precious moment in this season was the public opening of the state guest house of Japan in Akasaka, Tokyo. One of the pictures below shows the guest palace behind me. It is a pity I can not show you the pictures inside the gate which is also very artistic as we are requested not to upload them by the Japanese Government. Enjoy staying in Japan. It is one of the best sight-seeing season here. I attended a couple of occasion to enjoy profound beauties of Japanese culture last week. One is a special night-time performance of Noh drama in Meiji Jingu shrine in Harajuku which is usually closed after sunset. The dark approaches to and from the main premaise were surrounded by hundreds of small candles in small white box. People solemnly attending the occasion were walking slowly toward the performing area with at most care to avoid colliding as their sights were very limited. 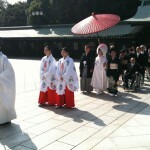 Another precious occasion in this season was the public opening of the state guest house of Japan in Akasaka, Tokyo. 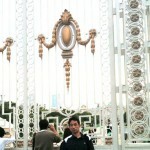 One of the pictures shows the guest palace behind me. It is a pity I can not show you the pictures inside the gate which is also very artistic as we are requested not to upload them by the Japanese Government. Enjoy staying in Japan. It is one of the best sight-seeing season here. Yesterday, I experienced my first costume-play bar in Akihabara, Tokyo. Honestly, though I am attending this Akihabara autumn campaign, had no chance to enjoy such latest style bar in Tokyo until then. I just experienced a maid-cafe and a couple of butler’s cafes. One of the four cute girls in maid-style costume served a glass of non-alcohol drink, Yum-yum magic breath soda for me. ‘Oishiku nare, oishiku nare…’ (Be tastier, Be tastier)… A little witch, the cute girl, casts a spell on your drink to make it tastier, as she chants. Then, there was a dance performance by those girls, which followed by an amazing guests performance!! About an hour and a half later, we left the bar with a kind of satisfaction and excitement owing to friendly and healthy service offered by the bar. Photo: Above:In the center is a Yokoso-Japan ambassador Mr. Izumi of ATPA, Akihabara Tourism Promotion Association. 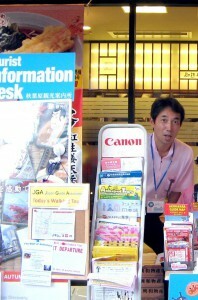 I stationed at an information desk by Akihabara Tourist Promotion Association this afternoon. As today is a Japanese national holiday, there were a lot of visitors rushed in even from inside Japan, many foreigner as well. As a part of Akihabara tourism promotion campaign this time, there will be mini festival at a costume-play cafe, “Koakuma-no-Utage Little BSD” on every Thursday in October with special low admission fee 1500 yen. There will be live performance and photo sessions at the cafe where girls in costumes of anime characters serve. I will be attending the occasion on coming Thursday, 14th October. If anybody, who wanna face a part of deep Otaku, Japanese nerds’ culture, would like to attend such occasion, don’t miss it. Go to the walking tour site below and book!! Akiba, nerds’ paradise, Kicked Off! Akihabara, nerds’ paradise, started a month-long autumn campaign last Friday! A couple of professional tourist guide bodies has joined the campaign to guide foreign tourists in this international nerds’ town. Though I also joined this campaign last Monday, because of some unknown reasons very few guest visited our Information Desk just walking distance from the JR Akihabara station. In October, with very reasonable prices we are ready to guide you around Akihabara town, which is full of tourist resources like maids’ cafe , animation center and so on. Go to Map! See no. 9. 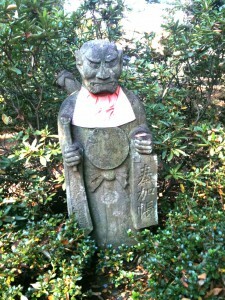 Our walking tours including animation center and Ghibli Museum in Tokyo are as follows. Please come and see us! Akiba to Move this autumn~More walking tours! A professional guide body, the Japan Guide Association , JGA is to launch more anime related walking tours this October. Responding to a call by NPO,Akihabara Tourism Promotion Association, ATPA, we are planning to create very unique and flexible tours which will utilize individual professional guides’ ability and knowledge. During the Akihabara promotion period in October, ATPA will set up Akihabara Tourist Information Desk at the Takarada Musen, where those walking tour information will be provided and its basement will be a meeting point of the tours. Personally, I am considering to offer a Ghibli related walking tour at Akihabara. See you then!